Complete set of spark plugs for your make/model/year and engine size. Please select your engine size above. 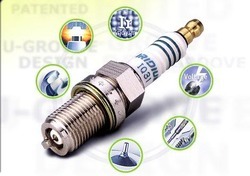 Iridium spark plugs require on average 5000 fewer volts to fire than conventional spark plugs. Less power is required to fire DENSO Iridium Power Plugs, and coupled with our patented U-Groove technology, the use of Iridium alloy, the tapered cut, and the ultra fine 0.4mm diameter electrode translates to increased horsepower throughout the dyno range. "Iridium Power is the only true high performance spark plug on the aftermarket today. We've tested hundreds of spark plugs at our facility and no other plug has ever made an increase in horsepower and performance on our dynos, like the DENSO Iridium plugs have." Iridium is six times harder and eight times stronger than platinum. This means that spark plugs can have even finer electrodes than ever before and still have excellent wear characteristics. Platinum is precious enough, but iridium is even more precious and expensive.